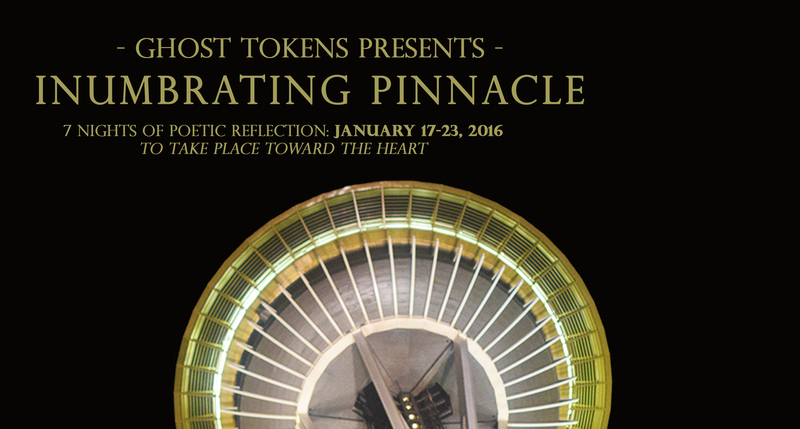 From 1/17 to 1/23 there will be 7 literary events under the series name “Inumbrating Pinnacle.” There will be one Ghost Tokens event per night, each to occur at 9pm, all outdoors in the historic “heart of Seattle,” the Seattle Center, underneath the light and shadow of the Space Needle. Confronting the triumphs and tragedies, the plateaus and recesses of the city elevated, these free micro-events are intended to respond to the fast, urban experience. Each artist will confront and present mindfulness toward “the city undergoing transformation” within a city’s frame of space and time. The events will not last more than 30 minutes. Paul Constant wrote about the event and interviewed me for Seattle Review of Books. The Stranger has recommended the event. Graham Isaac created a Facebook page for the event. Posted in Upcoming Events. Bookmark the permalink.